I never tire of reminding liberals suspicious of evidence-based policy informed by Randomised Controlled Trials that they are literally are a liberal idea: they’re founded on father-of-liberalism John Stuart Mill’s ‘method of difference’ through which the observed difference between two groups can be measured to identify the ‘active ingredient’ which works. (‘Risk and Evidence of Bias in Randomized Controlled Trials in Economics’, Eble, Alex and Boone, Peter and Elbourne, Diana, Risk and Evidence of Bias in Randomized Controlled Trials in Economics (January 6, 2014). Mimeo, (2013), Brown University. Available at SSRN: http://ssrn.com/abstract=2272141). Hat-tip: @TimHarford. 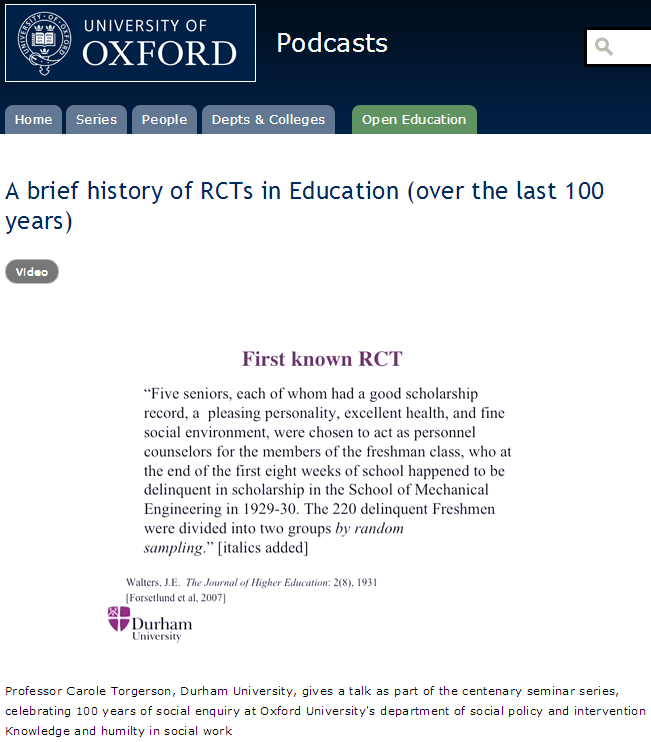 (Hat-tip: A brief history of RCTs in Education (over the last 100 years) – Professor Carole Torgerson, Durham University).